Veggie steaks, burgers and hot dogs are available at Citizens Bank Park. IN 2007 AND AGAIN in 2008, Citizens Bank Park was named North America's Most Vegetarian-Friendly Ballpark. And after more than a decade of drought, in 2007 and again in 2008, the Phillies made the playoffs. Not if you ask Scott Geiger, the Phillies fan who's been helping the ballpark expand its menu. "It's no coincidence," he said with a straight face, "that the Phillies have made the playoffs two years in a row, the same two years they've had the No. 1 most vegan-friendly ballpark." But as he goes on, it actually starts to make sense - at least as much as that thing about Billy Penn's hat. "The Phillies, and Aramark, made a huge leap," Geiger insisted, "and had the foresight to see what it would mean to the fans and the team to have this kind of positive publicity." Let's look at the record: Readers may remember the first veggie offering, a Gardenburger, in 2005, which yours truly traveled to the park to sample in a previous YO! Food story. But the burger by itself was not enough to goose the Phillies' fortunes: They ended the season a little over .500 and went home. 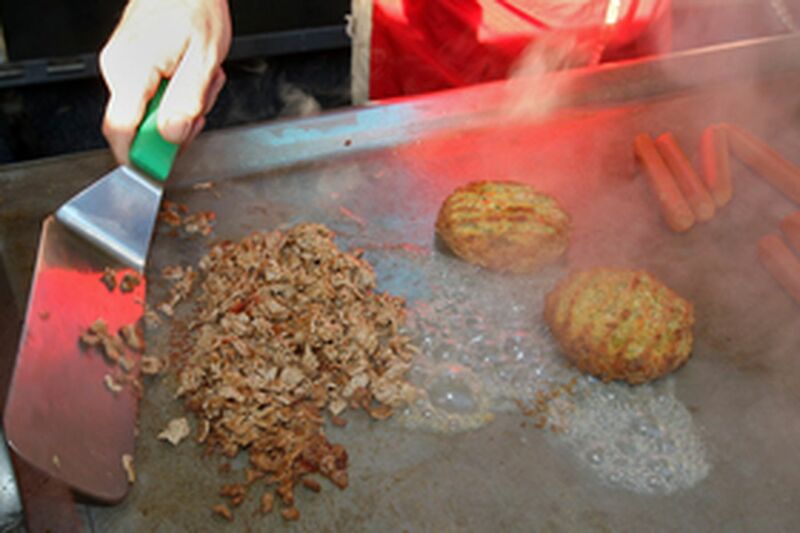 Next year, CB Park introduced the quintessential ballpark food - hot dogs - in a vegan version in addition to the burgers. The 2006 Phillies, consequently, went right down to the wire, missing the playoffs by just one game. 2007 saw the addition of a vegetarian cheesesteak (or as Geiger calls it, a vegan steak sandwich, if you get it without cheese), and the Phillies went just over the wire, getting swept out of the National League Division Series by the Rockies. This year, CB Park pulled out all the stops, piling on both a mock-chicken cheesesteak and crabless crab cakes - and yes, now the Fightin' Phils are playing for the National League pennant, on their way to becoming World Series champions! Kevin Tedesco, the director of concessions at the park, played along: "Oh sure. History proves that if you win this [Most Veg-Friendly Ballpark] award, you get into the playoffs." More seriously, he explained that "we try to have something for everybody. People come out to the game, they bring their girlfriends, boyfriends, parents, kids, grandparents, you name it. All kinds of people." He confirmed that all the veggie options will be available throughout the division series, and, if it happens, the World Series. Ashburn Alley is the hot spot for the veggie steak sandwiches (at Rick's Steaks) and crab-free crab cakes (at Planet Hoagie), while the veggie dogs and veggie burgers are available at locations throughout the park. Geiger pointed out that the inclusive menu is not just a public service: "It's bringing people to the ballpark that wouldn't normally go to the ballpark, [vegetarians] that may not be sports fans, but now they come to hang out with their friends and family because there's stuff they can eat. "And there are plenty of people who aren't vegetarian but are health-conscious and wouldn't necessarily eat a lot of the regular offerings - they will now be buying food, so they're adding more sales overall." And that's just two potential groups, Geiger added. More people are striving to reduce their carbon footprint, and recent studies have shown meat production to be a bigger global-warming threat than cars. Some folks may be like author and Inquirer columnist Lisa Scottoline, who recently wrote about giving up beef, pork and chicken after becoming more familiar with the real animals behind these products. Still others may be true-blue Philadelphians curious to try a veggie version of our signature sandwich, which is starting to crop up all over town. "It was the cheesesteaks that really put us over the top the past couple years," Tedesco said, referring to the ballpark award, rather than the Phillies record - I think. "We [will] try to figure out how to do even better next year, look at our most popular items and see if we can find the same thing in a vegan version." steak is "definitely a consistent seller" for the Phillies. He looks forward to seeing similar options at the homes of the Eagles, Sixers and Flyers. "We're working on getting into the rest of the stadiums since Citizens is having so much success with it. I think just naturally it's going to happen." Could be - the Eagles introduced veggie burgers and veggie dogs this season at Lincoln Financial Field. Meanwhile, Ike Richman of Comcast-Spectacor, who oversees concessions for the Sixers and Flyers, is more status-quo for his teams. "We do have some non-meat options," he said in a cheery voice mail. "There are salads, for example. We've surveyed our customers, and they are satisfied with our lineup, so there are no plans to change at this time." Geiger responded that "salads are great at home, but when you go out to a game, you want something fun, some filling 'comfort food' that's a real alternative to a meat product." Geiger also said that through his organization, Club Veg Philly, he knows "many vegetarians and vegans who go to the games" of different Philly teams, "and none of them have been surveyed. They wouldn't say they're satisfied" with the options at other venues. Whatever the exact case, it's the Phillies who are setting the bar for new and fun fan foods, and who, so far, seem to be reaping the rewards by advancing through the postseason. And food-wise, the Eagles are showing promise.